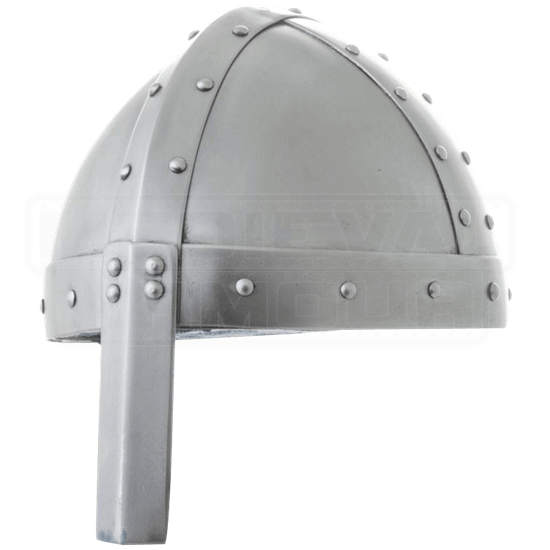 The spangenhelm was a popular helmet choice in the Middle Ages, and this Steel Spangenhelm embodies the style well. Made up of 16 gauge steel segments joined by 17 gauge steel riveted strips, it also features a nose guard. An inner canvas lining adds to its wearability, though most plate armour pieces should still be worn with a padded underlayer, such as an arming cap, for safety and comfort. Great for historic reenactment, a leather chin strap is included with this helmet. Due to the handcrafted construction of the helmet, the steel thickness may feature slight variations.